Of all the many animal species in Alaska, several tend to come to mind first. The grizzly bear, the wolf, caribou, and the moose are probably the most iconic land dwellers in Alaska. Among the water dwellers, it is the salmon that best characterizes the forty-ninth state. And among all the species of salmon, the King salmon (also known as the Chinook salmon) reigns supreme. A case could be made for the King salmon as the most iconic species in all of Alaska, given its tremendous numbers, its culinary appeal, and the fact that fishing for King salmon often puts you in close proximity to the grizzly bear. For the past 55 years Chinook Salmon (aka King Salmon) has been known as the official state fish of Alaska. This much celebrated species of fish is coveted for its large size, nutritional value, migratory behaviors and sport fishing adventures. 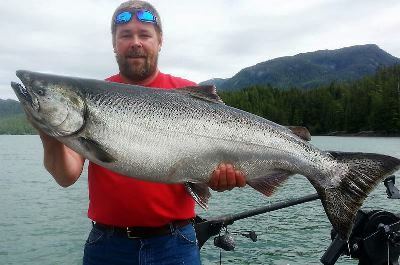 Anglers Adventures & Outfitters is proud to offer king salmon guided fishing charters for up to 6 guests. 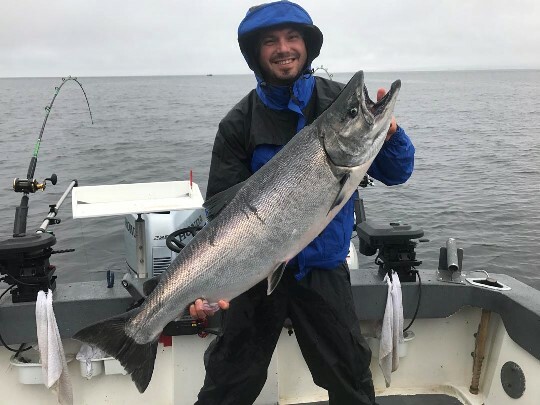 Our experienced fishing boat captain knows all of the favorite Alaska salmon fishing spots that are known only to locals. 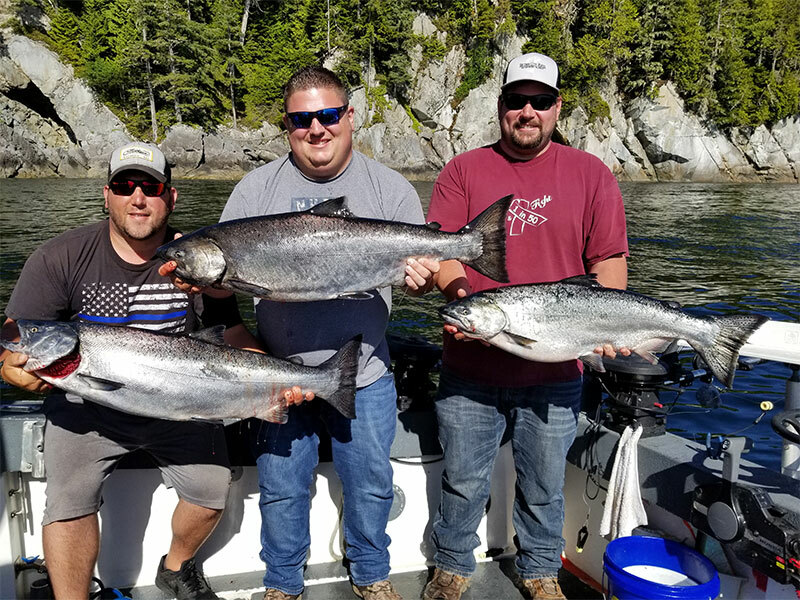 When you book a sport fishing expedition with Anglers Adventures & Outfitters you can enjoy the best king salmon fishing trip of a lifetime while being awed by the rugged coastal beauty of Southeast Alaska. 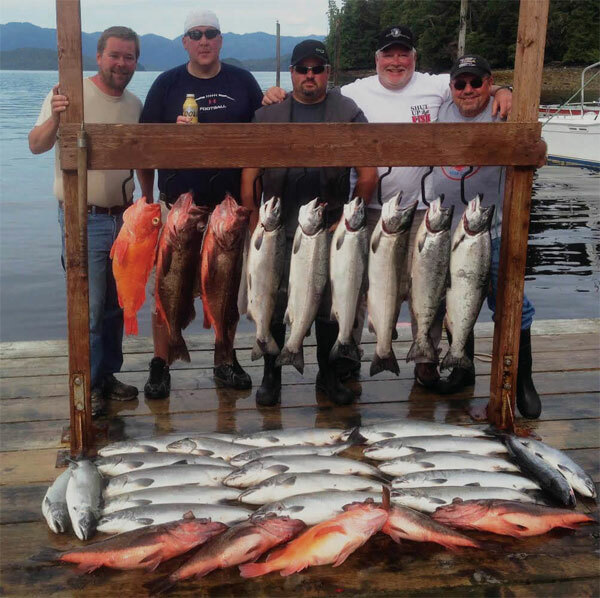 Get ready for one of the most unforgettable adventures of your life when you set out on the best multiple day fishing charter in beautiful Ketchikan, Alaska with Anglers Adventures & Outfitters! Both experienced and novice fishermen and women can expect to be wowed by the incredible beauty of forested mountain scenery and local wildlife. Plan on an abundance of fish with the guidance of Captain Brian. People of all ages catch their limit of big and tasty salmon, halibut, rockfish or cod. Alaska is known around the world for its incredible beauty, vast wilderness and as in the southeastern city of Ketchikan AK, some of the worlds best salmon fishing. 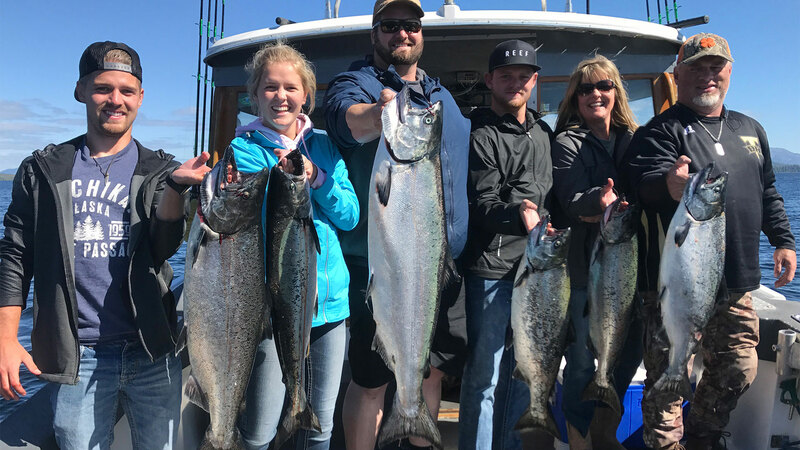 This is where your unforgettable salmon fishing adventure begins with a chartered, private boat excursion guided by Anglers Adventures & Outfitters. As you arrive in Ketchikan you will probably find a quaint city that isn’t afraid to declare itself the Salmon Capital of the World. 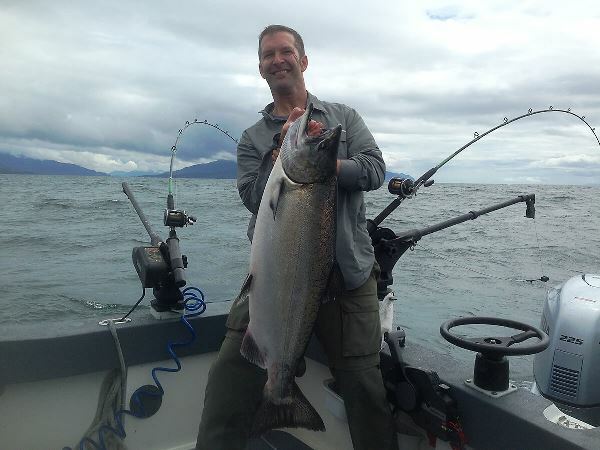 And Captain Brian Ringeisen is the #1 rate sport fishing guide in Ketchikan!